This Orgone Pendant was created with the intention to bring peace, love and harmony into your environment. Use the Orgone energy to access the Universal Love within and without. 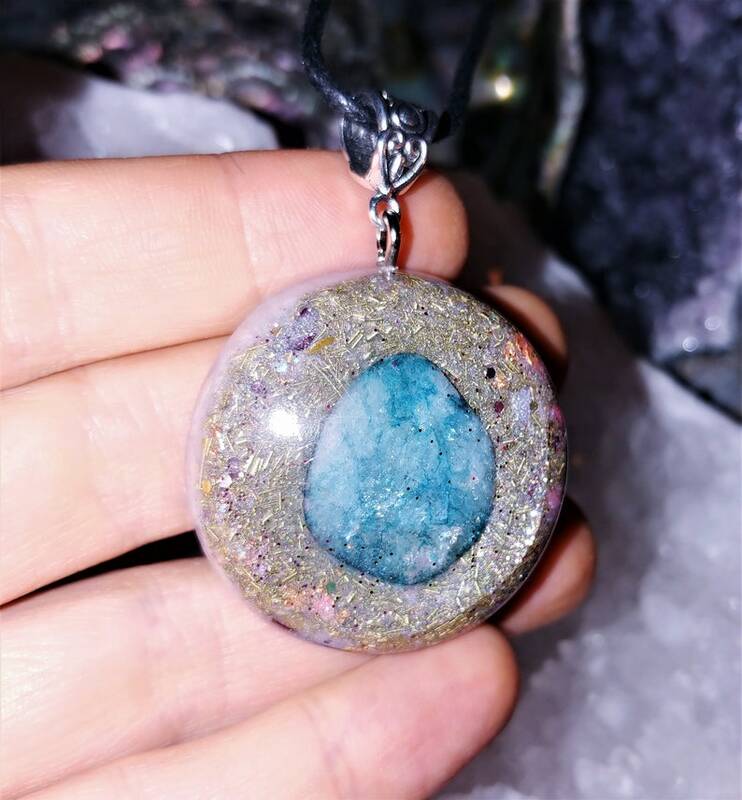 In this Orgone piece I have combined crystals and contents that, when mixed together, create amazing energy field of Love, promote healing and Divine connection. This powerful little jewelry piece is not only meant to be a pretty accessory, but also created to provide strong EMF protection and free your space from any radiation from your phone or computer, or from any negative energy in your surroundings. This orgone's best use is to clear any negative energy, keep it by your side during meditation, set it by your bed side, or near any electric devices to clear the radiation from it. Wearing this necklace will help you in balancing and harmonizing chakras, while connecting mind, body and spirit as one, activating your Chi channels and clearing all the negative energy in your body and around you. It will bring love, awareness and luck into your life. Necklace contains: Chrysocolla (color enhanced), Shungite powder, Black Sun Iron Oxide powder, clear quartz crystal powder, pyrite stones, copper coils, mica, 24 k gold leaf, tesla coil, Reiki healing energy, Love and Light, 528 Hz frequency. Chrysocolla is a tranquil and sustaining stone. It helps meditation and communication. Within the home, Chrysocolla draws off negative energies of all kinds. It can help you to accept with serenity situations that are constantly changing, invoking great inner strength. It is beneficial to relationships that have become rocky, stabilizing and healing both the home and personal interaction. Chrysocolla is powerful for opening and stimulating the Throat Chakra, allowing one to channel the loving knowledge of the heart to others. It allows for clear communication of one’s innate inner wisdom, even discerning what that wisdom may be. The surprise of hearing oneself speak aloud a thought more profound than what one had in mind demonstrates this gift of expression. Chrysocolla calms, cleanses and reenergizes all the chakras and aligns them with the divine. At the solar plexus chakra it draws out negative emotions such as guilt and reverses destructive emotional programming. At the heart chakra it heals heartache and increases the capacity to love. At the throat, it improves communication but helps you to discern when to keep silent. At the third eye it opens psychic vision. Psychologically, Chrysocolla encourages self-awareness and inner balance, and imparts confidence and sensitivity. It enhances personal power and inspires creativity. Overcoming phobias, it draws out negativity and supplies motivation for those who lack it. Mentally, this stone reduces mental tensions and helps you to keep a cool head. It promotes truth-telling and impartiality. Emotionally it alleviates guilt and brings in joy. Chrysocolla is a stone of empowerment of the feminine energies, teaching that genuine power is best expressed through gentleness. It is a stone of the Goddess, and those who resonate with it will likely feel her ancient and enduring energies rising within themselves. Comes on free 16" black cord necklace. Such an amazing and beautiful piece with excellent craftsmanship. Looking forward to purchasing more in the future!